We take pride in creating your flawless wedding day look for you based on your personality and style! We believe every bride is unique and it's all about the details to make your morning perfect on your wedding day. All of our packages are customized to suit your needs. Please contact us for pricing information. We travel right to you for your wedding day for added convenience with on-location hair and makeup services. We service the local triangle including Raleigh, Durham, Cary, Chapel Hill, Apex and Wake Forest. We are also available for destination upon request. Do you offer airbrush and/or traditional makeup? Do you offer false lashes if desired, and do you use individual lashes or full strip lashes? Yes. Both, and more! Our lash kits are filled with all types of false lashes, it completely depends on your personal preference, desired look, and style. We are very experienced with all types of lashes. What are your prices, and what kind of packages do you offer? Our pricing for the bride is based on many factors (season, location, weekday/weekend, upgrades etc.). For all others than the bride, as point of reference, our pricing starts at $170/person for hair and makeup, or $85 for hair or makeup only. We customize a package for each of our clients that will encompass the specific needs around the wedding day (bridal party size, family members, flower girls, location of event, upgrades, etc. ), and events leading up to the wedding day such as engagements, bridal portraits, rehearsal dinner, and bridal showers. What size bridal party can you service? We can provide services to all those who would like hair and makeup services. It’s one of the many perks in hiring a team. Our average bridal party size is bride + 7 others, for hair and makeup, but we have serviced up to bride + 22 others for hair and makeup in one given morning. When you book makeup with us, you are reserving 1 Makeup Artist. When you book hair with us, you are reserving 1 Hair Stylist. Additional team members may be added for an additional fee. Will you make a timeline for the wedding day? Yes! 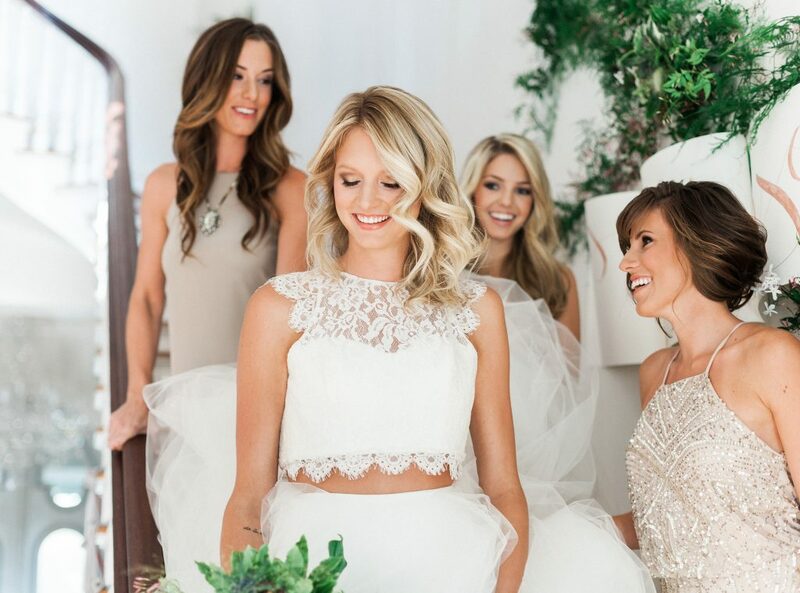 Ashley takes care of collecting the necessary details to create a custom hair and makeup timeline for the morning of your wedding. Each person receiving services will have a specific time assigned. Your morning running smoothly and on time + feeling your most beautiful self, is the promise we make to our clients. We believe it’s the only way to start your wedding day! Do you travel to my location for the wedding day? How far do you travel? Most definitely! We come to your location on your wedding day for added convivence and for the full luxury and pampering experience. Whether you choose your venue’s bridal suite, hotel or inn suite, or personal residence, we will be there!! We love traveling! Whether it’s to other areas in North Carolina, out of state, or destination we’d love to be a part of your day! Please inquire for details. Do you have a minimum to book my wedding date? Yes. Due to high demand, we require that a certain number of clients receive services in order to book an event. This number is based on the season and team availability; more details provided upon inquiry. As soon as you know your date, it is best to reserve your date as bookings fill up quickly! We accept signed contract and non-refundable retainers up to 18months in advance. We use a variety of prestigious lines including but not limited to Bobbi Brown, Chanel, Laura Mercier, Makeup For Ever and Urban Decay for makeup. Hair products include, Bumble and Bumble, Moroccanoil, Amika, Kenra, Redkin, Kenra.